This article introduces the reader to some of the hierarchies that are contained within most organizations. We discuss uses and limitations of this information. The typical company organogram shows the line management relationship between two individuals. That is it shows who within an organisation reports to whom. Within large organisations this can be extremely useful information to access. For example when is trying to resolve a difficult decision or conflicting views between two peers the decision is often "escalated" to the person above. In any sized organisation it is possible to keep escalating further and further up the hierarchy until finding a single individual who is able to make a decision to resolve the issue. In Figure 1 below, if Rosalyn and Bill cannot agree then they can escalate their issue to Hannah for resolution. If Rosalyn and Tony cannot agree, then they can escalate to Hannah and Mike respectively. If Hannah and Mike cannot agree then they can escalate to Peter. Whilst the process of escalating an issue through an organisation may not be always desirable it does mean that, in theory at least, there should always be someone in the organisation who can make a final decision. In real-life certain behaviours can be observed the effects of these can be both positive and negative depending on the context and culture of the organisation. Decision bottle-necks occur when too many decisions need to be escalated to higher levels. This is often compounded by the fact that senior levels of management are often extremely busy. Lobbying of decision makers occurs with politically astute lower level staff members trying to ensure that their views or ideas take precedence over other ideas being forwarded by their peers. Information Filtering : Peter does not get to hear the real risks and issues from Rosalyn, Bill, Toby and Tony as they are filtered by Hannah and Mike. Succession Planning : Hierarchy immediately gives the organisation a choice of succession plan. If Hannah were to leave then Rosalyn or Bill could step into the role. Although most people who work in structured companies are aware of the Line Management hierachy there are several other inherent hierarchies within organisations. Not all will be present in all organisations and some large organisations will exhibit all of them. By recognising the existence of other hierarchies it is possible to take advantage of them and build software applications that allow the organisation to take advantage of the information contained within. All but the smallest of companies will usually be comprised of one or more organizational units. These can be of varying size and may or may not be based in the same location or can be based in multiple locations. For large multinationals the picture is complicated further with legal entities often created to allow trading within different tax and legal juristrictions. The creation of "Joint Ventures" between two or more distinct companies can also add further complexity to the picture. Below is listed typical organisational units. Departments - Smaller departments, usually specialising in one specific area of expertise. For example, telecoms or policy. Teams - Normally the smallest organised unit. Concentrating on a particular niche skill. Staff - And finally we get down to the people within the organisation! Figure 2. Below shows the organisation of an imaginary company. This is not fully expanded as each sub group could be divided down further. In the example in Figure 2. We have a large organisation presented in a simple, accessible manner. The chart displays the number of employees and head of each unit. 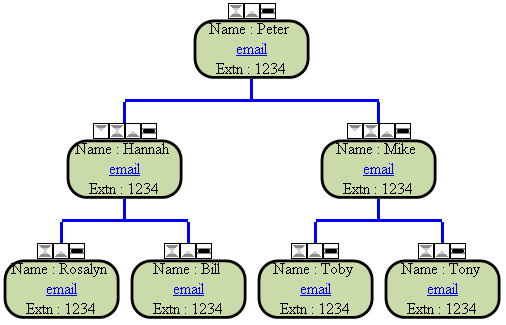 By making the "unit head" a hyperlink the programmer could allow end users to easily switch from an organizational chart to a line management chart. We could also display key performance indicators ( KPI's ) relevant to each unit , in this example we have used "head count". The next hierarchy to consider is locational. Locations can be thought of as a hierarchy starting with "The World" ( or "Global" ) as the top of the tree and splitting down further into regions, countries, counties or states, cities and streets. At the bottom of each branch of the hierarchy will be an actual physical location usually with some company asset ( an office, manufacturing plant, service centre etc ) located at it.